Everybody type is different, you’re not just an apple or a pear, your front back and side are 3 different planes! Often times, you have more than one dominant ‘shape” present, add your height and muscle tone and each individual is truly unique! Why are you shocked when mass produced garments designed for dress forms do little for your unique 3 dimensional curves! Learn your body shape and how to map your style lines while learning tricks to accentuate, complement, detract and even hide what you’ve got! In our VIRTUAL Style Canvas offer you can sign up for a bespoke body redux session (we’ll email you instructions) to take 4 images and instruct you in use of your personal guide. You’ll get a personal style canvas as well as a printable croquis to sketch you idea over… as well as 5-10 sketch of style silhouettes based on your lifestyle needs! It’s also a great intro to virtual fitting and clothing selection! When added to actual measurements and specs they become a powerful tool!ign and shopping. 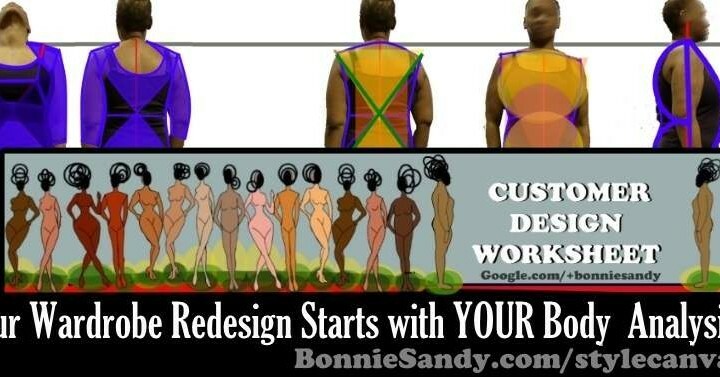 Body Redux explores your body’s unique design canvas and empowers you with the tools to better design or select wardrobe pieces! Sign up by March 11th 2015 at 12 Midnight and get our Bonus Styling Bonus Pack! If you promote, write about, sell or showcase fashion, if you make your own clothing. Even if you simply give style advice to friends or do so professionally… it’s time to get solid tools and learn solid techniques help shape your decisions as to whether or not the fashion you wear – the apparel is “Fit for your Approval”. The “Style Canvas offer & Bonus pack” is essentially “Technical Product Analysis for digital fashion and style consumers & service provider”!